This entry was posted on Sunday, November 18th, 2012 at 12:39 pm and is filed under Book/Film News, Hollywood History. You can follow any responses to this entry through the RSS 2.0 feed. You can skip to the end and leave a response. Pinging is currently not allowed. Maybe Jack Pickford’s wife,Olive Thomas is haunting Pickfair? I saw the TV show you referenced…….you’d think even Pia could come up with a better cover story than this. An attempt to disguise the fact that it was her lack of taste, class, and intellect that led her to raze the Hollywood equivalent of Buckingham Palace by blaming GHOSTS? Please. What Scatter said. I so remember this when it happened and have been quietly (or not so quietly) cursing these two ever since. After reading your (most excellent) article, all I can think of is why in the hell didn’t these two self absorbed greedy people just MOVE? They could have easily lived somewhere else, whereas Pickfair (as is/was Falcon Lair) a ONCE. The aforementioned comments were edited with extreme self control and all screaming frustrated obscenities were modified. What a shame to destroy such an amazing landmark, marking the glories of Hollywood. Thanks again Allan for such an excellent article. Some individuals taste seems to be arrested in their toes!!!!!!!!!! Not defending her at all, but to your point about ghosts leaving the house once it’s torn down, the only example I can think of is Clifton Webb, who supposedly haunted his beloved estate on Rexford Drive until it was demolished, whereupon he moved his haunting act to the halls of the Abbey of the Psalms Mausoleum where he is interred. At least, according to the books. Olive Thomas, Jack’s wife passed away in Paris. I believe Mary wasn’t happy that Jack married Olive. A laughing ghost? IF there was a ghost on the premises and it was in a good mood, then where is the threat? People have lived in haunted dwellings and gotten used to the activity, so long as nothing was terribly disturbing. If it was that much of a nuisance, it would have been easy to sell Pickfair for a pretty penny. A historical dwelling AND it’s haunted. There are many people who would have been happy to keep it as it was. Although, it’s more likely that Pia Zadora is making a weak attempt at excusing poor judgement, while hoping to get her name publicized once again. This is too nauseating to read about the “nothing” Pia!! What a likely story about Pickfair. If it was that bad, why not sell it and move? That mansion should still be standing as an icon to Hollywood old Style. 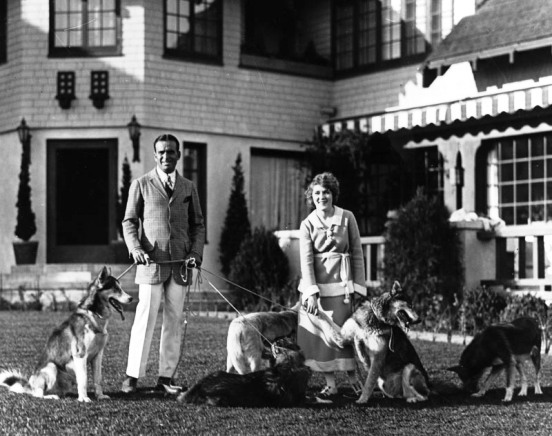 New mansions can be built anywhere, but not on the precious site of the once great estate of Mary Pickford! Shame shame shame on you Pia!!!!!!!! Great story Allan. Pia Zadora will go down in Hollywood History as one who destroyed Hollywood history. It’s as sad as Pia’s shelf life as an actress. I actually taught piano lessons to Pia’s daughter a few times at the new house. Back in the early 2000’s. Pia was very nice, but I was indeed shocked that she razed the entire historic property that was the original Pickfair! Real shame. The interior of the new place is totally devoid of all charm and grace that I’m sure the original home had. As someone with a particular interest in the paranormal, I find the destruction of this home appalling. Pia Zadora should really be ashamed of herself (honestly, for a number of reasons). She had something wonderful and one-of-a-kind, and she tore it apart like a petulant child. I kind of hope she ends up in a tenement. I am only 50 years old, but I loved the classic, great actors. I had the Hollywood dream, itch to go there, explore. I’d met DF Jr while working @ a local TV station in FL. Pickfair was always a dream destination, it held much magic. It had held the love affair of Hollywood’s sweethearts. To make a very long story short, I was there during the 1984 Olympic’s. A director pal asked me to go see the women’s basketball competition @ The Forum. He picked me up in a limo (thrilling of course for a young girl, would have been enough!) then said we were picking up his friend. When I saw the gates that said Pickfair I almost had a heart attack! We were picking up Jerry Buss! I was gobsmacked to say the least! I remember being impressed with first the kitchen. I was shown several rooms, my memory is a bit cloudy as I was so in awe to actually be there, but I feel like I remember a circus room or wall paper looking like that?? I remember going up to Jerry’e suite for a few short minutes. His what, man servant?? showed us up. I remember him helping him with his jacket and brushing it off. Also scoffing & giggling to myself a little @ that pomp, lol. I asked if they’d excuse me as I’d love to see the grounds. I walked way out to where the pool was and the rose gardens. Not sure if it was where Ms Pickford had her’s originally. But it was beautiful & magical. I just stood there drinking it all in. Imagining the people that had walked where I was standing. I felt exhilerated and blessed to have experienced my dream visit without ever even having asked. It was so karmically cool. I know it was just a house, and the actors were but human. But omg, it was spectacular. And I remember almost bursting into tears when I read Pia Zadora had it torn down. Let me tell you, when I was there in 1984, the place looked immaculate. A wonderful, grand house & home. Lost forever. Shame on you Pia. Jerry never should have sold it to them. Thanks for hearing my small part of Pickfair memories. I think all your tidbits of Hollywood History would make a great book. Yes?! Perhaps the spirit was attached to one of them, and tearing down a house won’t rid them of it. Kinda LAME ! “Actress Pia Zadora and her husband, Meshulam Riklis, then bought the house and started refurbishing but soon learned that the house had to be torn down, due to termites. The house was subsequently rebuilt but needs renovating again, real estate sources say. IT NEEDS A RENO ALREADY! Only in L.A….. So many historic homes were lost in the 80’s and 90’s. Throughout that period, foreign-born Israelis like Riklis (Turkey) were buying BH mansions and doing this same thing. Homes were being razed and hideous, trashy new ones were being built right to the property lines. The uproar reached a peak when this same thing happened to the Dorsey brothers estate… a tragic loss due to an idiot with no American history in his blood but who had lots of money. That was the last straw for the BH city council, which finally passed a law requiring owners to apply for a permit before substantially altering any structure in certain areas of town. I hope it has stopped the insanity. I would have sold Pickfair. Some people do not feel the presence of spirits in the way others may. I have felt their presence and seen them, but am still not sure of what happened. We lived in a house where I believe a spirit (the builder) was trapped or wanted to be there. All I remember (at the age of 16) was that it changed my father ( a horrible mean person) into a lovable father figure for the short time we lived there. This spirit tormented my father. When we moved ( out of fear) my father went back to his horrible self. I will never understand what happened and if it really effected my father. You know good & well she never had any interest in living in Pickfair. She destroyed an irreplaceable piece of Hollywood history & is still catching grief about it to this day… as she should. She just brought it up to get a little publicity for herself. I’m sorry but a person who would build the current tacky & gaudy home would never be interested in Pickfair except to raze it. She should have kept the termites excuse bc at least that was a bit more believable. I’m not saying that ghosts weren’t there but destroying the home wouldn’t do much. It was an old home & termites could have done unfixable damage but she went with an excuse as outlandish as the new home. She basically destroyed the west coast White House. Bad judgement by people with no love of history. Money rules their lives. I agree, if you don’t want to keep the house, go somewhere undeveloped and build your dream McMansion. Trash with cash, destroying an iconic landmark. What’s new? Seen any of the fugly, modern, oversized, boxes “developers” build in L.A. for millions now? Guess that vulgar dump they replaced Pickfair with, fixed everything. Hmm? Taste, class & historical preservation mean nothing to current robots who can’t get their noses out of their “stupid-phones” even when having dinner with friends and/or family. Enjoy your “smarthouses” when your kids are grown enough to ignore you. Cats-in-a-Cradle lyrics may never cease to apply. “Mark”. In regards your clumsy attempt at shaming some of the vitriolic comments on here, I could not disagree with you more. People commenting here are clearly fascinated by history. Pia Zadora and her husband were public figures, making public statements about a decision that affects many interested parties. Movie fans, Hollywood historians. It was not “just a house” to them, even if it wasn’t their property. They are angry, justifiably so, that history can be so callously disregarded. It is a public issue, like it or not, and free speech allows people to express their disappointment about an irreplaceable loss. You want to feel smug and judgementsal, fine, that’s your business, but it seems to me that you are being dismissive and patronizing about sincere statements of regret and anger. Don’t they count as much as Pia Zadora’s sense of embarrassment? Food for thought.